1. Whisk together 1 large egg, 1 large egg white and 1 tablespoon skim milk. Cook in a nonstick skillet coated with cooking spray until firm. 2. Spoon divided mixture into warm tortillas. Sprinkle with sharp cheddar cheese; roll up. 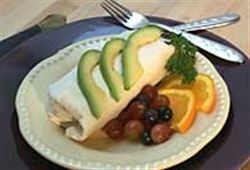 Enjoy this delicious quick cheese and egg breakfast burrito Mexican food recipe!